Warner Bros Pictures is promoting the launch of the movie Sherlock Holmes with a two-player on-line experience, 221B, online at www.221B.sh. The movie, directed by Guy Ritchie and starring Robert Downey Jr., Jude Law and Rachel McAdams, will be released in the UK on Boxing Day, 26th December 2009. 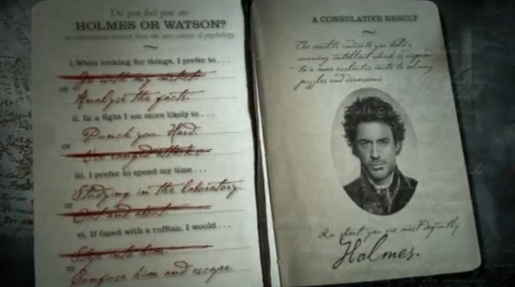 In 221B, players team up as Holmes and Watson, who together will chase villains, interact with other characters from the movie, explore locations and make deductions as they journey through eight chapters of intrigue and mystery, concluding in a segue into the start of the movie. Played online, free of charge to all, the rich audio-visual experience brings alive the 1890s London of Guy Ritchie’s film by blending cutting-edge technology, exquisite design and a world of unique content, drawn from exclusive access granted to the cast, crew and locations during the making of the movie itself. It will also allow fans a special preview look into the world of Sherlock Holmes prior to its worldwide in-cinema debut. The 221B game was developed at AKQA, London, by chief creative officer James Hilton, art directors Nick Morland, Shahpour Abbasvand, creative development director Rick Williams, senior creative developers David Wiltshire, Paddy Keane, Thijs Triemstra, Tristan Holman, user experience architect Chris Dowsett, senior web developers James Turner, Francis Saul, web developers Alex Gemmell: Paul Anderson, creative developers Denis Nemytov, Huy Dinh, senior software engineer Josh Duck, senior QA analysts Noaman Tareen, Andrew Khamlu, associate post production assistant Andy Briscoe, technical director Ben Jones. Working with AKQA were game designers and co-creators Hide & Seek, AI developers Existor, Flash game developers Johnny Two Shoes, and video production and editing company Spicer Moore.